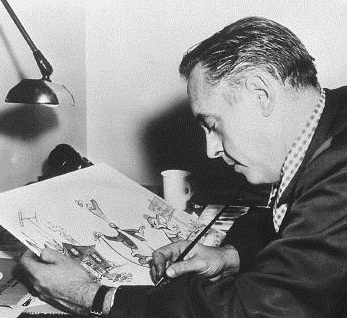 HOLLYWOOD DETOUR (1942) --- Frank Tashlin detoured over from Warners (where he was better off) to try and upgrade Columbia's cartoon shop, which was not a patch on least of WB effort. Tash's work is said to be oasis in a desert that was Columbia animation, but Hollywood Detour is no proof of that, being weakest tea beside Warners' previous year Hollywood Steps Out, a primer of how to do filmland caricaturing right. There's energy lacking, dullish pace, and not-as-good impressions of known stars, all of whom had been done, and closer to accurate, by WB. The John Barrymore gag, he's always in profile no matter how positioned, was took from CooCoo Nut Grove, a Warner cartoon done back in 1936. Star impressions are always fun even when cribbed off elsewhere; here they filch to a point of looking like stock footage. Columbia had a rough time getting their cartoon act together until release of innovative UPA subjects in the 50's. Possibly it's just as well N.C. stations didn't use them much in syndication. Is there fan longing for Scrappy and Columbia Rhapsodies? IN WONDERLAND (1931) --- Disney was thought smashed when he lost Oswald The Rabbit to ruthless machinations of Charles Mintz and Universal, the latter actual owner of the animated character. Walt bounced immediately back with Mickey Mouse creation, but what of Oswald? He'd go on with Universal, their having chucked Mintz (who most would agree had it coming) and turned the Rabbit over to company men Walter Lantz and Bill Nolan, these no slouches at continuation of a still popular series. Oswald went through several permutations, here living with Granny and tended by cats and rats. Threats from a peg-legged landlord (further Disney borrowing) necessitate beanstalk climb after dismemberment of a cow's head, that last better seen prior enough to bedtime so as to forget. There are fights with a monstrous bull and giant spider ... In Wonderland would have programmed well with Universal's feature offerings of the same year, Dracula and Frankenstein. 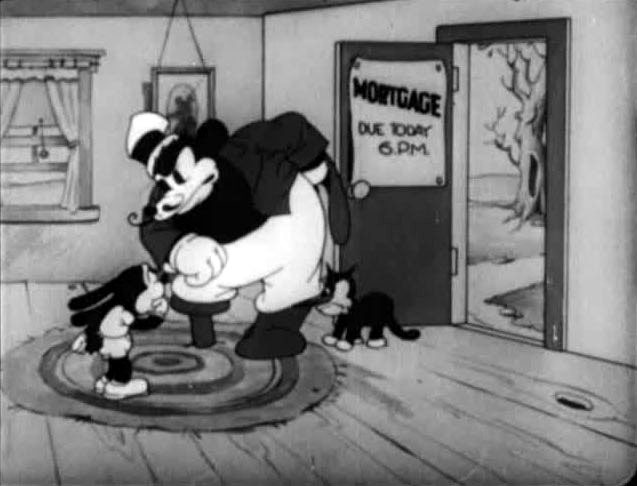 The 1931 cartoon is among offerings of Thunderbean Animation's Attack Of The 30's Characters DVD, a first-rate compilation featuring many rarities. Thunderbean has a new compilation out, "Lantz Studio Treasures Starring Oswald." 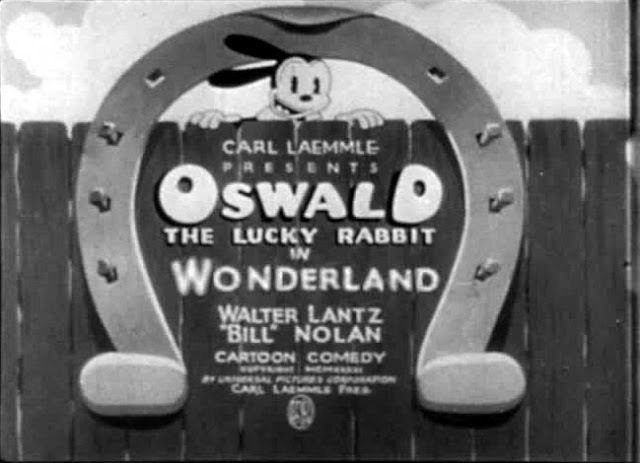 It has eight Oswalds, beginning with a couple of Disneys reissued by Lantz with sound and ending with two later entries showing Oswald as a Disney-cute little rabbit. There are also TV/theatrical commercials (one featuring yet another updated Oswald), a few fun silents by Lantz, and some additional sound cartoons including "Scrub Me Mama With a Boogie Beat", a typically cornball Lantz musical with a cast of black stereotypes. The two "Woody Woodpecker and Friends Classic Cartoon Collections" from Universal each offer some Lantz-made Oswalds, all but one featuring the original almost-Mickey design (even as the characters around him were looking more evolved). Okay. This Post sent me up to my movie room where I still have the 16mm cartoons (most of the features having gone the way of ebay long ago. )Had to confirm what I already knew, namely that I still have more Scrappy cartoons then practically anything else excluding Popeye and Mickey Mouse. Not that I'm a nut on the character exactly... it's just that he was 1930s animation incarnate, and most of his oeuvre was rare enough to be considered a find whenever one popped up for sale or trade. Couldn't turn 'em down. Kind of love Oswald too, in all his varied versions, and that new Lantz DVD from Steve Stanchfield's Thunderbean is a four star pip! When I was a kid those Scrappy cartoons were ubiquitous on one of our local stations. The TV screen almost always crop the main title card (with the young hero in an iris looking over a fence) so as to cut the first letter off Scrappy's name, making it a "CRAPPY" cartoon. My brother and I agreed this was most appropriate.